He has a goal and a plan. If he carries through with the plan, his sister will die first. His ex will die next, and he will die last. In between, he’ll take out as many people as he can. Students. Security guards. Teachers. First responders. They are all fair game. Who will live, and who will die? How will those who live go on when their world is shattered by unthinkable tragedy? A sad but excellent account of what can occur when a school shooting happens. This should be read or listened to by all of us, to help us to be forewarned and ready to help some of those in need before it is too late. I thought this book was very well written, even though it was pretty inense at times. The characters were developed well so that you felt something for them when the events happened to each one, and it seemed like I was actually there. I liked that we got the story from so many different characters, including the shooter. The narrator did a great job pulling me into the story and into the characters. This was my first read of Julie Gilbert, and I'm glad I read it. 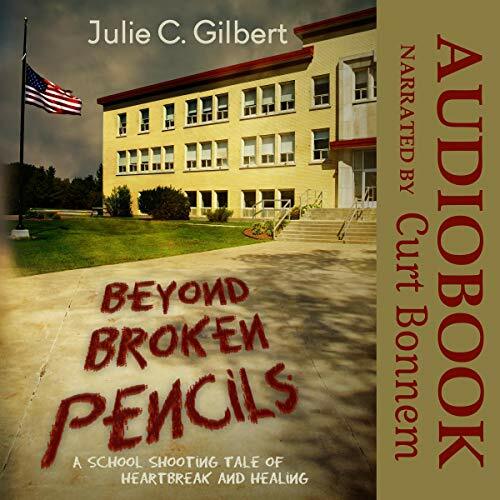 Beyond Broken Pencils is a fictional story that talks about one of the most heart-breaking realities of our time - school shootings in America. Julie Gilbert related a tale that was based on events that have been making the whole world sad and everyone wondering why such madness happen. I, personally, was moved by this book because I have children who goes to school and I worry for their safety everyday. We are not in America and I hope that no such thing will ever happen to our schools here. I like the book because it gave each characters their own highlights, particularly the main one. I cried a few times, and have asked myself if I am doing everything I can to support and love my kids. This book will do that to you, make you analyze how you are dealing with the children and teens in your life. They are the most vulnerable individuals in our society and it is about time to focus, not just on what, but also on HOW they are doing. I had a bit of an issue with the narration, but the story really made up for that.